Performances by: Rodney Crowell, Joe Ely, Bruce Robison, Lee Roy Parnell, Jack Ingram, Verlon Thompson, Terry Allen, Brennen Leigh, Shawn Camp, The Trishas, and Noel McKay. The Texas Heritage Songwriters’ Association (TxHSA) is a non-profit organization dedicated to honoring and celebrating Texas songwriters who have played an important role in defining and interpreting Texas’ distinctive culture. On this evening they will pay tribute to the life of the late Guy Clark, and honor his longtime manager, Tamara Saviano, with its DKR Texas Music Legend Award. The evening will include special performances of Clark’s music by a distinguished list of Texas songwriters and special guests. Clark was born in Monahans, Texas, and eventually settled in Nashville, where he helped create the progressive country and outlaw country genres. Most notably, his songs "L.A. Freeway" and "Desperados Waiting for a Train" helped launch a career and have been covered by numerous performers. Clark’s legacy maintains a devout following of fans that crosses many borders. His ability to have combined poignant melodies with insightful, touching lyrics earned him a seat at the Nashville Songwriters Foundation’s Songwriters Hall of Fame, the Americana Music Association’s Lifetime Achievement Award for Songwriting, a stint as the Artist-in-Residence at the County Music Hall of Fame and Museum and a place in the TxHSA’s Hall of Fame. Clark earned a Grammy Award in 2014 for Best Folk Album: My Favorite Picture of You. Tamara Saviano, a Wisconsin native and Nashville resident, is no stranger to Texas music. During the past two decades, she has established herself as a tireless advocate of American music and its artists, notably working at length with Texas singer-songwriters Kris Kristofferson, Radney Foster, and Mr. Clark. She is a GRAMMY-winning producer, publicist, manager, live concert producer, talent booker, and former music television producer and music journalist. The TxHSA will recognize Ms. Savino for providing a lifetime of recognition and support to Texas songwriters and present her with its Darrell K Royal Texas Music Legend Award. 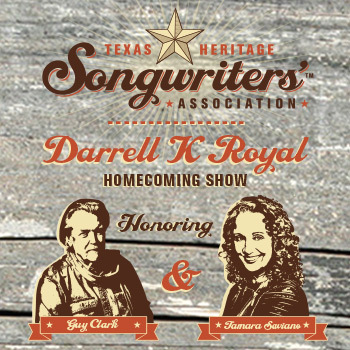 Coach Royal, the original recipient, spent years supporting and honoring songwriters, and the TxHSA proudly carries the spirit of his efforts forward, in his name.